The Final Solution To Direct Coupling !! TonePros Sound Labs International is a company comprised of professional luthiers and sound design specialists with years of experience in the music production and design fields. After years of successfully working independently with music professionals, they joined forces to create TonePros. The company was formed in 1998 with the goal of solving common problems and improving sound quality for everyone from the novice player to the top professional. They are committed to providing superior quality products and services at a price that is affordable to all players of stringed instruments. Please read on to discover what top professionals who use System II components have to say about Tone Pros designs and services. System II Bridge & Tailpiece come stock on Quicksilver, Centurion, JET, Abstract Or we can install it on most guitars utilizing Schaller or Gibson Tune-a-matic bridges. Available in nickel, chrome, black, or gold, and in standard and import models (import has metric thread and larger adjustment post hole on the bridge). For 50 years, Guitar Player's bridges and tailpieces have been falling off every time they remove their strings. Tone/Pros has finally solved that problem forever and give you improved sustain and better intonation stability. Prevent your bridge and tailpiece from ever falling off again. No more worrying about scratching the face of your guitar or readjusting the intonation and action after a simple cleaning or changing of strings. Your guitar will sustain and play in tune like never before. 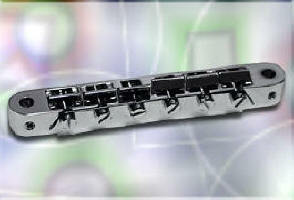 Because these bridges lock solidly in place, your intonation will be much more accurate, and stay that way! Tone/Pros components require no modification of your instrument, no drilling, routing, "cutting or gutting", simply drop in, adjust, and you are done! You will not adversely effect the value of your guitar. your guitar will look "vintage" or as if no changes were made at all, it will just stay together, sound, sustain, and stay in tune better. The cost is the same or less than replacing with stock, inferior parts. Gibson is now using Gotoh Bridges on their guitars now for at least 3 years. Contact World Class Guitars for all your Tone Pros components. Some companies that I know that use Tone/Pros bridges, Quicksilver, Baker, JET, RVC. Abstract. Some companies that are not using these components as of this writing. Gibson, PRS, Fender, Hamer, Epiphone, Brian Moore, BC Rich, Ibanez, ESP, Carvin, Peavey, Washburn, Yamaha. Contact Ed Roman Guitars for replacement Tone/Pros bridges for these brands of guitars. Enter the new TonePros ® AVR-II (Advanced Vintage Replacement-II) TonePros ® AVR-II is the upgrade for the old ABR-1 style bridge and is the "next step" in the evolution of high performance components retaining vintage appearance & functionality. While AVR-II's appearance is vintage, with the gaps above the intonation screws and the retaining wire, TonePros ® engineering has provided solid secure saddles with increased intonation travel. This prevents the old "loose-o-matic" saddle movement & "saddle lift" (the saddles are secure even if the wire is off!) while providing superior coupling for better resonance transfer. This new design provides the solid intonation and increased sustain you expect from TonePros ®, along with the signature "Locking" TonePros ® features. Available in original vintage colors: Nickel, Gold, and Chrome. You're website is freakin' awesome... I have to pay my respects for you calling them as you see them (the Rants section), I just can't get enough of it. Anyways, my name is Pierce May from Fresno, CA, and I have a (what I consider) legitimate question to ask you regarding a guitar of mine. It is a Jackson USA KV2, I love it to death, without a doubt the best guitar I own. The only thing is that I really don't use the Floyd Rose tremolo system a whole lot; in fact it kind of debilitates my style of playing, which incorporates plenty of pedal steel bends a la Jimmy Page, Slash, and Zakk Wylde among other. I believe I had read somewhere on the website you mentioning doing a tremolo to fixed bridge (or even string thru) conversion, or something like that... 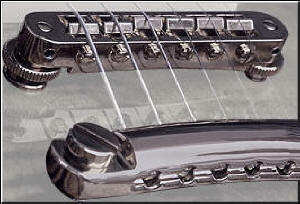 I was wondering if that is even possible or a feasible thing to do to such a guitar? I also could not find a price for such a custom job on the site, so I decided to ask. I can assure you that whether I opt to have you to work your magic on it, or buy another awesome guitar like that but string thru, it will be only through you guys. Why? All there is here in Fresno is you guessed it: Guitar Center. We already know how much abundant crap and nothingness they carry in stock (a bunch of black Squier Strats, like my first guitar!). I'm not into gambling, but would go to Vegas in a heartbeat to see your inventory full of cool stuff unheard of in my neck of the US, and exclusively just for that! Anyways, I hope I don't sound like a broken record, so thank you for your insight on guitars and the business in general. It is people like you who inspire me to either buy a really awesome one of a kind completely hand made American guitar, Keep up the good work! Monte Pittman, Guitarist - MADONNA "TonePros ® has turned my Guitars into completely new guitars. Even Madonna, who hasn't been playing for more than a year, notices the difference. After picking mine up one day, she had one put on her Guitar." Dave Costner, Guitar Tech/Luthier - Lonestar, Steve Wariner, Steppenwolf, Phoenix Guitar Co., Fritz Bros. "As a tech, it's great to be able to remove all of the strings without the bridge falling off. 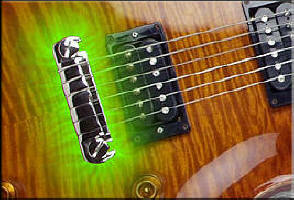 TonePros ® made my own guitar a much 'livelier' instrument; resonance was markedly improved. The whole guitar vibrates now when I play, and that makes it a lot easier to really 'get into' the music." Peter Waltz, Tour Tech - ROLLING STONES/EAGLES "This system works fantastic, I have been waiting for something like this for years. I had no idea that it would work so well, and I appreciate your great service, too. Keep it up TonePros ®." David Sikes, Bassist - BOSTON "I have never seen a system that was so effective at solving so many problems and looks and sounds great. It makes all the difference on my guitars, thanks TonePros ®!" Jesse Bradman - Night Ranger/Poison "You guys have done it again. Finally, the ultimate system. My guitars have never sounded so good, cheers TonePros ®."